Saksrithai – Vatic Ventures Corp.
Vatic’s ‘Saksrithai’ project covers an area of 32 km² in Nakhon Ratchasima province, northeast Thailand, 270 km from Bangkok. The project area is contiguous to the Dan Khun Thot project, presently under development by Thai Kali Ltd., where a high grade carnallite-sylvinite reserve has been delineated. In 2014, the Thai Ministry of Industry set up a special steering committee to promote the development of the country’s potash resources. Mining licenses have since been approved for two projects in the country, with license pending for the third. 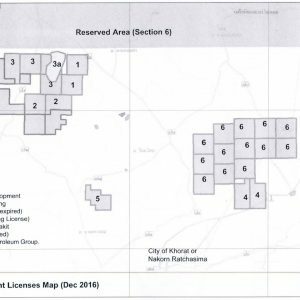 In addition, several new exploration licenses have been granted. New exploration license holders include: Rong Pang Mining, Sahachart Setthakit, and International Petroleum Group. The initial resource evaluation phase, comprising seismic survey, geological survey and interpretation, diamond-drilling program, baseline environmental studies and local community programs, commenced March 2017 and continues into early-2018. Phase 1 of the project, with a budget of $1.5 million, includes the completion of a pre-feasibility study and estimation of a ‘potash resource’. Phase 2 (of up to $5 million) includes additional seismic and drilling programs, EIA, mining, processing, transportation and marketing studies, leading to a bankable feasibility study and defined ‘potash reserve’.